Hebrews Series 15 - What Are Angels? To find out let's look back to the very beginning. Open your Bible to Genesis 1:1. "In the beginning God...." God was before all. The next word in the King James version is "created." "God created." He created the heaven and the earth. But the very next verse says this: "The earth was without form, and void." The Hebrew words for "without form, and void" arc tohu and bohu. Translated into English they mean chaotic, in confusion, waste, and empty. We read in I Corinthians 14:33 that "God is NOT the author of confusion " God is the author of peace. God is the author of order and of law. The book of Job shows God talking with Job about the creation. God is saying to Job, "Where wast thou when I laid the foundations of the earth?" There is the implication here that Job had directed the building of some very great edifice — such as the great pyramid of Giza in Egypt. Job was righteous and somewhat proud of his accomplishments. God was whittling him down to humility by a comparison of accomplishments. It is significant that the great pyramid is a building where the corner stone is not laid in the foundation, but the final stone to be laid — at the pinnacle. The "morning stars" are light-(truth-) bringing angels and archangels, according to Biblical interpretation of symbols. As creations of God, they also are referred to as "all the sons of God." So this, too, implies a perfect and glorious creation of the earth. In Jeremiah 4:23, Isaiah 34:11, and in other places in the Bible, you find the same words, tohu and bohu, meaning "chaotic" and "in confusion." In every case that condition is o result of sin. The original Hebrew word there is TOHU. This Hebrew word is the identical word used in Genesis L:2, meaning "confusion," or "emptiness," or "waste" — a result of disorder, a result of violation of law. In Isaiah 45:18 we have the plain statement that God created the earth Nor tohu, that is, not in confusion, not in disorder. But in Genesis 1:2, the earth was (because it had become) chaotic and in confusion! Then it became that way after it was created. Now, what could have caused that confusion — that disorder? What sin could have wrecked the earth and brought it into the condition in which it was found in Genesis 1:2? Next, let's turn to II Peter 2:4: "For if God spared not the angels that sinned...." Here is the sin of angels mentioned. Was there a chaotic condition brought about on the earth as a result of the sins of angels? The sin of the angels is mentioned first, and it occurred first! There was a devil already there in existence by the time Adam was created. So the sin of the angels happened before the creation of man. Now read II Peter 2:6. "Turning the cities of Sodom and Gomorrha into ashes [God] condemned them with an overthrow, making them an ensample unto those that after should live ungodly." How plain! They had an estate which they didn't keep. In Hebrews 2:5 we read this: "For unto the angels hath God not put in subjection the world to come, whereof we speak." In other words, the World Tomorrow, the Kingdom of God, will not be under subjection to angels. The present one is under subjection of fallen angels. The demons, and the devil who is their head, rule this present earth and sway its inhabitants. The Bible everywhere indicates and affirms that very fact. The devil is the leader of fallen angels, as you will find in a number of places (John 12:31; Matt. 12:26; 25:41; Rev. 12:9). In II Corinthians 4:4 the devil is called "the god of this world." He is the king or the prince of the evil world that we live in today. Let's see something about the origin of the devil. This "king of Babylon" is the future ruler over the prophesied "United States of Europe" — the coming resurrected "Holy Roman Empire," described in prophecies of Revelation 17 and 18. It is a system described in Revelation 13 which was given its power and seat by Satan. Then in verse 12, the type — this human king of Babylon — lifts to the arch-antitype, Satan. Satan is to be removed and bound after the Messiah's coming. Ezekiel's prophecy, to be described later, reveals that he is the former archangel cherub, Lucifer. "How art thou fallen from heaven, O Lucifer, son of the morning! how art thou cut down to the ground, which didst weaken the nations! For thou hast said in thine heart, I will ascend into heaven, I will exalt my throne above the stars of God: I will sit also upon the mount of the congregation, in the sides of the north: I will ascend above the heights of the clouds; I will be like the most High" (Isaiah 14:12-14). The 15th verse returns to the human king. Notice, this former archangel had been placed as ruler over the angels that sinned. He had a throne. He said he would exalt his throne above the stars (angels) of God. It already was exalted above the angels on earth — the angels that sinned with him. Now he was going to exalt it over God's ANGELS in heaven. He was going to invade God's heaven, knock God off the throne of the universe, and rule the whole universe! We learn much more about this cherub who became Satan in Ezekiel 28. Here, beginning verse 1, the human prince of Tyre is referred to, wealthy (chapter 27), surrounded by perfect beauty, saying in his vain heart, "I am a God," — "I sit in the seat of God" (verse 2) — compare with II Thessalonians 2:3-4. "Son of man, take up a lamentation [dirge] upon the king of Tyrus [Tyre]...." The whole prophecy of chapters 27 and 28 refers, not to the ruler of the ancient city of Tyre (as does chapter 26), but to an important personage, in Satan's hand, of our time — and immediate future — just before the coming of the Messiah to remove Satan and bring in world peace. Therefore the prophecy points to the END of this great personage ruling spiritually over nations — as well as to Satan's removal from swaying mankind on earth. Now, beginning with verse 12, and on to the middle of verse 17, it speaks of Satan himself. So, continue: "... And say unto him, Thus saith the Lord Eternal; Thou sealest up the sum, full of wisdom, and perfect in beauty. Thou hast been in Eden the garden of God; every precious stone was thy covering... the workmanship of thy tabrets and of thy pipes [music] was prepared in thee in the day that thou wast created." "... Thou wast upon the holy mountain of God; thou hast walked up and down in the midst of the stones of fire. Thou wast perfect in thy ways from the day that thou wast created, till iniquity [lawlessness] wast found in thee." Then God attributes to him violence, sin, corruption of wisdom, perversion, saying he became proud — his heart lifted up because of his beauty. Then, in verse 17, the immortal spirit antitype descends again to the human type, who will be a chief instrument in Satan's hands in the tremendous world events just prior to, and leading to the coming of the Messiah to establish the GOVERNMENT OF GOD over all earth's nations. This human personage, claiming to be God, sitting in his sanctuary (verse 18) showing that he is God (II Thess. 2:3-4), is to be destroyed by FIRE, brought to ashes (verse 18). Compare with Revelation 19:20. In the latter, two human personages, instruments of Satan, are pictured — one a civil ruler over ten kings and their nations, the other called a great "False Prophet" (Rev. 19:20). The prophecy of Isaiah 14 pictures the king of Babylon as the civil ruler. There was happiness, peace, joy on earth. Of Lucifer, the Moffatt translation reads: "From the day you were created, you lived a perfect life, till you were discovered doing wrong" (Ezek. 28:15). GOD DID NOT CREATE A DEVIL, but a beautiful, perfect superangel. But God did give to His angels free moral agency — minds that were free to think and reason — the right of free choice. Lucifer had allowed his beauty and perfection to fill him with vanity — with SELF-glory, SELF-desire. He became envious of God's power, resented authority over him. He plotted with his angels to marshal them into an invading army, to invade the heaven of God, to knock God off the throne of the Universe. So Lucifer was no longer "LIGHT-Bringer" but now an ADVERSARY — an aggressor, a competitor, an enemy. The name Satan means "Adversary." His angels now became DEMONS. A third of the angels united with Satan in the rebellion. That is what caused the chaos of this earth. The sin of angels reached into the heavens and brought chaos on earth. What the geologists and astronomers see is not an evolving universe, but the wreckage of a titanic battle waged by spirits throughout space — a battle fought before man's creation. Jesus Christ came 4,000 years later and He entered the great contest — the contest of the temptation on the Mount. He REFUSED obey the devil He quoted scripture correctly. He obeyed God. 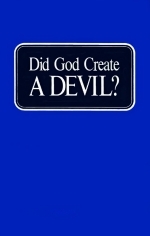 So God did NOT create a devil. He created a cherub, Lucifer — perfect in his ways, but with the power of free choice — and Lucifer transformed himself into a devil by rebellion against the Government of God!